Bill Pinkham presenting Norma and Ernie Pailthorpe with a cake, at the Gymkhana,on the occasion of their 60th Wedding Anniversary. Overall winner was Lyn Baines in the Spitfire There were 24 cars at the event, which was good. A sunny day and a great atmosphere. There were 15 competitive cars, and 3 who did the tests but were non-competitive. Thank you Marshalls, organisers and helpers. Ed. Our morning “tea meet and greet” in the Bentley Room at Southwards this month, provided interesting surroundings for 21 members to catch up with each other. Southwards Manager, Craig Andrews, outlined the multi-function aspects of Southwards diversity of working towards Southwards as a destination. Craig also said that at the moment, Southwards were in discussion with governing auto identities with this in mind; a flurry of interesting questions was forth coming from the group. OBITUARIES Alan Dray, a former Wellington Branch member, passed away last week, in the Far North, where he had been living. Alan, along with his Brother, Colin, was a founder member of the Wellington branch Our condolences go to his wife, Prue. MARCH CLUB NIGHT Aleck Jenner entertained us with some magic tricksâ&#x20AC;&#x201D;well, he had a box full of weird bits and pieces that he passed around for us to try and guess as to their uses in the past and present. There were the retractors from early seat belts, a light bulb he had made, and some items that looked suspiciously like some painful looking needles to extract blood from unwilling arms, or maybe for liposuction, but which actually turned out to be spikes used in police road spikes: the hollowness allowing air to escape the tyres. Next, Bill Pinkham had decided that we should really have a demonstration of how and where to escape from the building in the event that an alarm should go off. Illuminated exit signs were demonstrated and designated exits were pointed out. Building safety rules were explained and then the fire alarm was set off so that we hear the sound and to also hear the voice activation explaining that it was an evacuation and that we should head for the nearest exit and assemble at the meeting point that is indicated on the evacuation cards. Thanks to Aleck and Bill. From Brian and Gill Ward: Feb. Mid-week run. It was an absolute pleasure to host the Run again this year. 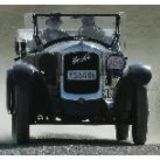 As can be seen from the photographs the weather was wonderful and we had a stunning collection of cars to see and talk about. It looked like a Jaguar Car Show. My SS had to stay in the garage because I had left the lights on and the battery went flat. We had Paul Wilson’s C Type Jaguar, my E type Coupe (that I was reminded was getting a bit frayed round the edges like its owner). Alan Pratt and Ken Savilles’s great MK2s and Murray Hislop’s very desirable Mk 1 and my XK8 Coupe. Roland Ward brought along his XK150 coupe with rare fitted luggage in the boot, which was a pleasure to examine. Down on the bottom lawn, we had a wide variety of cars from Ian McCulloch’s rare Oakland coupe, a 1957 Lincoln Premier, a BMW Roadster, a Riley and the Jollife’s Triumph. It was all in all, a great turnout. Alan Freeman also turned up and it was great to see him, he must be well into his ‘90s It was an excellent start to the year and our heartfelt thanks go to Ann and Hal O’Rorke and Trevor Barnes for putting in the hard yards to organise our runs. Brian and Gill Ward. March Sunday Run: Richard Davies Seven cars and two motorcycles took part in this months Sunday run. Some of us chose to meet up at the Mayfair CafĂŠ in Upper Hutt, for morning tea, at around 10.00am. At around noon, we all left for the tractor collection in Upper Hutt, arriving about 30 minutes later. What a great display! Twelve tractors and one vintage truck, a 1928 Morris. Of the twelve tractors, eleven were wheeled and one was a crawler. Our host Ken was able to start two of the tractors. We left at about 2.00pm and some of us decided to go to Harcourt Park for a picnic lunch and a natter in the sunshine, before going our different ways. Thank you to Ken and to Ian McCulloch for organising the day. Here is part 2 of the article started last month, on Gabriel Snubbers and Watson Stabilators. National South Island Easter Rally. Contact Alastair McCarthy for details and entry forms. ========================================================================== 26th -27th April: Maunga Moana Rally: New Plymouth. Examples of what would be ideal for the Ford Motor Company display, mentioned earlier in the newsletter article by John Stokes. Ed. Photos from the M/C Flat Possum Tour. John and Dave after lunch at the Yellow House, Whanganui. Trevor and Hal discussing Trevor's fetching Lemon attire!. Our Senior member, Des Vinten. Good to see some photos from the Motorcycle fraternity. Ed. National Motorcycle Rally: Blenheim 15th-17th February Thursday 14th, 8.45am, we are all set to go but first I have a 10pin bowling league to play, then it is all go. League finished, so we head into the Ferry for the 2.45pm sailing. Being Valentineâ&#x20AC;&#x2122;s Day, the crew were all jovial and at the end of the sailing, wore dress-up hats and handed out mini bars to every passenger as they disembarked. We headed to Blenheim and checked into our motel on arrival. As it was tea time, we went to a local pub for a very nice meal, before heading back to the motel. Friday dawned bright and sunny and after a few chores and lunch, we went to rally headquarters to pick up our rally pack, check on who was entered and reminisce with some of the entrants who were there at the time. Back to the motel for a bit of tea and then on to the meet and greet, for a chat. We met up with lots of older established friends, but as it was an early start the next day, we didn't stay long before going back to the motel for the night. Saturday was another hot day. I took Bill down to rally headquarters to meet up with David Williams from the Auckland branch, who was taking Bill as his sidecar passenger/navigator, or should I say aggravator. They were doing the medium run. The run contained a lap of the Hawkesbury Circuit, before heading toward Nelson, turning right at Havelock, onto Queen Charlotte Drive and on to Picton via the tourist route. From there they headed back towards Blenheim, to the lunch stop at Tuamarina School. After lunch there was a lot of touring before getting back to the rally finish. Dinner that evening was at the Marlborough Convention Centre with a guest speaker, Graham Crosby, who had the audience in fits of laughter with his talk. While Bill and David were on the run, I went on a shopping tour (didn't buy anything) in the morning and after lunch I went to the local 10pin bowling alley and played 4 games of bowls, then it was time to go and collect Bill from the rally finish. Sunday, was another long day, with gymkhana events, a public display and if you wanted to, a look through the aircraft museum, before the evening dinner and prize giving. Bill and Maureen Bull were honoured to receive a trophy each for having attended every rally, or in Bill's case, competing in every rally. Monday saw us heading home while some of the more hardy went on to do the after rally tour. Bevney Munro. Coming up next club night Dr Michael Taylor will be talking about the restoration of his Packard, which was runner up in the Restoration Of The Year completion, this year. FOR SALE 1974 Triumph 2000 MKII 4 speed manual. 1000000kms, yellow. One small rust spot on the bottom of one door. Asking $4500. 1990 Jaguar XJS C. 3.6 litre 4 speed auto. 96000kms. 2 owners. Maroon. Good condition. Asking $22000. In a hostage situation, you’re likely to be released first. Things you buy wont wear out. You can eat supper at 5pm. Your supply of brain cells is finally down to a manageable level. BE REPEATED FOUR TIMES ADVERTISERS: PLEASE ADVISE EDITOR WHEN ADVERTISEMENT IS NO LONGER NEEDED. Don’t worry, flying is still the safest way to travel!. VERO INSURANCE If you arrange your car and household insurance through Vero, the Wellington Branch gets a commission. Last year it amounted to $2,300.00. 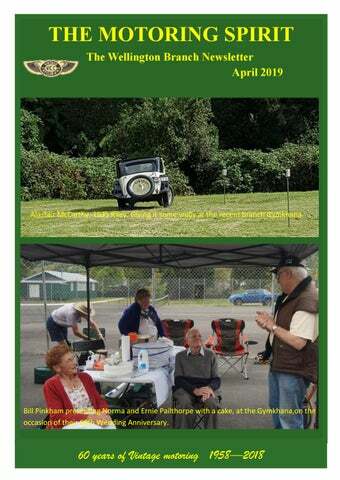 Mention this ad and receive 10% discount BLUEBRIDGE COOK STRAIT FERRY Now to 30 June 2019 Bluebridge has notified us of the latest discounts for vehicles on their ferry between Wellington and Picton for Vintage Car Club members as follows: The VCC code is ANTIQUECAR. It excludes travel between 15 Dec. and 15 Jan. Plus Easter weekend. : Discounted - 10% off all available fares. Ring 0800 844 844, www.bluebridge.co.nz for conditions. NOTE; Remember to get this discount. For this you must present your VCC membership card when you check in on the day of your trip. It is not enough to have quoted it when you booked and paid for the ticket. Also it may not be enough to have booked electronically unless you have a printed copy of your electronic booking on the day.If not you may have to pay again then go for a refund for the original booking These rules may apply to the Interislander also. BEWARE. WELLINGTON BRANCHâ&#x20AC;&#x201D;CALENDAR OF EVENTS Club nights are on the 3rd Tuesday of every month in the Clubrooms, Halford Place, Petone (eastern end of Jackson St) at 7:30pm. The Clubrooms are also open Wednesdays from 9:30 to 12:00, and for Noggin & Natter Fridays from 7:00pm ($1 for biscuits, tea and coffee free) Motorcycle Meetings are usually held on the 4th Monday of the month in the Butcher & Brewer, 175 Jackson Street, Petone at 7:30pm. Some of the vehicles at the Wards place. Feb. Kapiti mid-week run. Photos, courtesy of Brian and Gill Ward.